Rest day today. I ended up doing my 7 miles last night and based on the wind, I'm glad that I did. I'm still not feeling 100% but the weather was perfect last night when I ran so that helped keep me going. Only 13 planned for Sunday and I really glad it's a cut back week! I can't imagine what it's like over at Stony Creek where Coach Ken is training his dedicated TNT runners this morning. That run will today will surely test your commitment! Before someone comments, it looks like I did a ton of miles in February and while I did do more miles, the number is a little off for February because I have two runs that I did on vacation when the cruise ship was moving. I based those runs by time so taking that into account, you would need to subtract about 30 miles for an actual mileage of 135. 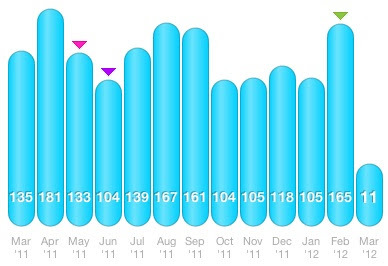 This number makes sense too since I've been upping my mileage for the Flying Pig Marathon coming in May. If you take a look back at last March, you will see that my miles were 135 and last year's marathon was in the end of May vs. the beginning of May for Flying Pig so it make sense. Year to date, I'm at about 250 miles. I've really be struggling through the last couple weeks and I've been through this a couple times already! It's making me question if I should bump up to the next level on Higdon's plan - I have a plan already done for summer with even higher mileage. I'm thinking perhaps I might stay under the same plan again. What I do know is that I have enough experience running to not change anything at this point. For those of you running your first marathon, I know you question each week if you can keep up and can you run longer than you did last weekend. You can do it. The body is an amazing thing - it's the mind that gets in the way! Even for us folks that have already run the distance. Great job in February and over the past year! Wow ALL of your months in the past year have been over 100? That's impressive! Keep it up! Man, I'm slacking!! Great job getting those runs in! !